(NaturalNews) According to the American Chiropractic Society, an estimated 68 to 80 percent of the United States population is deficient in the essential mineral magnesium. While our growing dependence on processed food is partly responsible for this alarming statistic, the real reason for it is that ongoing soil erosion has significantly depleted the mineral content of our soil within the last century. Consequently, many fruits and vegetables that were once rich in magnesium no longer contain it in adequate amounts, resulting in widespread deficiencies. Magnesium citrate -- Magnesium citrate is the most popular magnesium supplement, probably because it is inexpensive and easily absorbed. Since citric acid is a mild laxative, magnesium citrate functions as a constipation aid as well as a magnesium source. It is a great choice for individuals with rectal or colon problems but is unsuitable for those with loose bowel movements. Magnesium taurate -- Magnesium taurate is the best choice of magnesium supplement for people with cardiovascular issues, since it is known to prevent arrhythmias and guard the heart from damage caused by heart attacks. Magnesium taurate is easily absorbed (magnesium and taurine stabilize cell membranes together), and it contains no laxative properties. Magnesium malate -- Magnesium malate is a fantastic choice for people suffering from fatigue, since malic acid -- a natural fruit acid present in most cells in the body -- is a vital component of enzymes that play a key role in ATP synthesis and energy production. Since the ionic bonds of magnesium and malic acid are easily broken, magnesium malate is also highly soluble. Magnesium glycinate -- Magnesium glycinate (magnesium bound with glycine, a non-essential amino acid) is one of the most bioavailable and absorbable forms of magnesium, and also the least likely to induce diarrhea. It is the safest option for correcting a long-term deficiency. Magnesium chloride -- Though magnesium chloride only contains around 12 percent elemental magnesium, it has an impressive absorption rate and is the best form of magnesium to take for detoxing the cells and tissues. Moreover, chloride (not to be confused with chlorine, the toxic gas) aids kidney function and can boost a sluggish metabolism. Magnesium carbonate -- Magnesium carbonate is another popular, bioavailable form of magnesium that actually turns into magnesium chloride when it mixes with the hydrochloric acid in our stomachs. It is a good choice for people suffering from indigestion and acid reflux, since it contains antacid properties. Magnesium oxide -- Magnesium oxide is the most common form of magnesium sold in pharmacies, but it is non-chelated and possesses a poor absorption rate compared to those listed above. Magnesium sulfate -- Magnesium sulfate, also called Epsom salt, is a fantastic constipation aid but an unsafe source of dietary magnesium, since overdosing on it is easy. 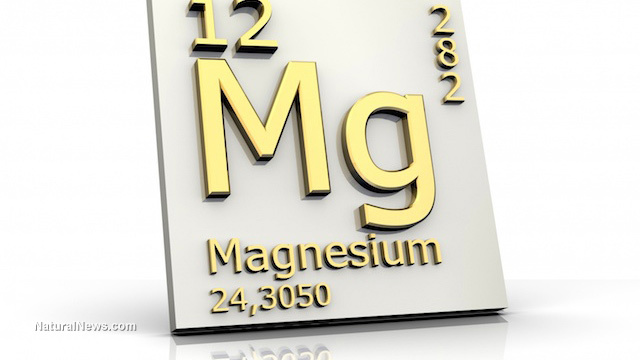 Magnesium glutamate and aspartate -- Avoid these two forms of magnesium completely. Glutamic acid and aspartic acid are components of the dangerous artificial sweetener aspartame, and both of them become neurotoxic when unbound to other amino acids.